Water is the most important element to support life. Without it, we can only function a few days and can survive only about a week. There's water around us all the time, we just can't see it. Water is a vital nutrient, yet one that is inaccessible to many worldwide. The World Health Organization reports that 780 million people don't have access to clean water, and 3.4 million die each year due to water-borne diseases. The air in our atmosphere contains a varying amount of water vapor, depending on the weather. When it's hot and humid, evaporated water can make up as much as 6 percent of the air we breathe. On cold, dry days it can be as low as .07 percent of the air's makeup, states U.S. Department of Energy. A team of seven Lord’s Engineering College students at Hyderabad has invented a device that generates around 40 litres of water from thin air; sufficient for a family in India. Their invention 'Aqua Generator' could solve the water crisis in remote areas and could be ideal for water scarcity place like battle fields or deserts. 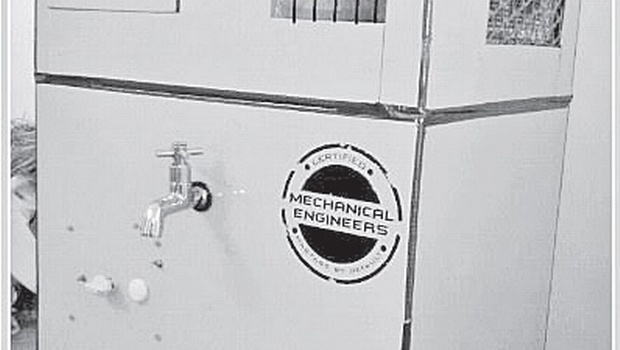 The team consists of Mohammed Muzaffer Hussain, Mohammed Parvez Qureshi, Mohammed Minhaj,Syed Abubaker Pasha, Salman Khan, Mohammed Munawar Uddin, Mohammed Sayeed and Mohammed Altaf, all in their third year in mechanical engineering. They got a support and guidance from the Research and Development Director Dr. Mohammed Masood and the HOD (Mechanical) Dr. Syed Azam Pasha Qadri under the leadership of Mohammed Muzzafer Hussain, the students say that besides generating water, their gadget also serves as a refrigerator, air conditioner and a water filter, reports Indian Express. The Aqua Generator could be served to the public and private sectors and used for residential and commercial applications. It took 60 days to invent this product at a cost of Rs 27,000, as reported by The Hans India. The device includes a water tank, humidity and temperature sensors which records all the atmospheric conditions. It is also fitted with a Purifier which provides clean and consumable water for the masses. The price of this device may vary from Rs. 15,000 to 25,000, it may increase after giving the global market look to machine. Aqua Generator is a green energy product as it consumes less than 6 Units a day and also has a dual mode option, which has solar panels attached, to utilize the solar energy. The water which was produced from the generator was tested at a private lab where the results said it was potable. “Mankind is in serious danger of exhausting the natural and renewable resources and it is very important that we find an alternative to either conserve our resources or use them wisely. It is machines like these that would help us consummate our resources”, expresses the Research and Development director Dr. Mohammed Masood, as reported by Indian Express. These innovators have also managed to patent their invention with the patent number 201641000768. In past, team had also made a few projects that involved the solar vehicle.